The Hyundai Motor Company is a division of the Hyundai Kia Automotive Group, which is the largest car manufacturer in South Korea and the seventh-largest automobile manufacturer in the world, owning and operating the world's largest car manufacturing plant. Hyundai brand has been associated with quality, safety and affordability. The company aims to deliver cars that inspire without necessarily costing a fortune. Hyundai's advances include safety features such as seatbelt pre-tensioners that restrain drivers earlier in a crash situation and headrests that minimize whiplash injuries. 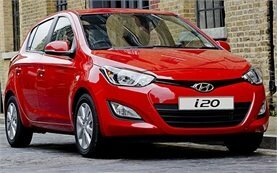 The Hyundai range of sedans, sport utility vehicles, coupes, and subcompact hatches are becoming increasingly popular among car hire customers in Europe and especially in Bulgaria in recent years. Some popular models of the brand include the Hyundai Sonata, a comfortable midsize sedan with a classic styling and voluminous space placing it among the luxury cars in its range, and the Hyundai Atos, a subcompact hatch and a very popular car rental choice for city drivers looking for a full package in a small car hire.